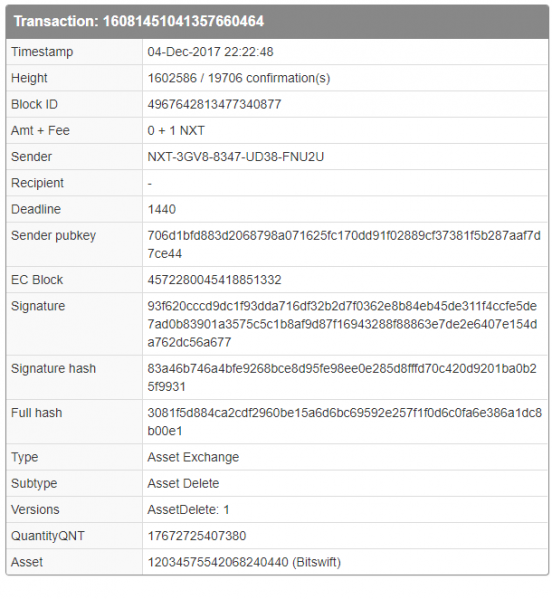 The Bitswift blockchain spawned its first public block on September 30th 2014. The concept was simple, to create a quicker version of the Bitcoin protocol and eliminate fees. Back then Bitswift was a simple proof of stake coin, with 3% staking interest, 30 second blocks, and a small community. All four million Bitswift tokens were initially mined on GPU through an X15 mining process until the network switched to pure Proof of Stake. The mined tokens were sent off to Bittrex for the token distribution. At this time the Bitswift project consisted of a few ideas, and what we can call a coin promotion group. The vast majority of the initial members of this group disappeared over time. Few stayed behind and continued to contribute to the project. Together this group managed to keep Bitswift tokens floating, as time went on the network was able to fund its own development as Bitswift tokens continuously increased in value and new community members joined and contributed to the project. To this day, through proper management, and the power of crypto, the Bitswift project continues to fund its own development. The Bitswift dev team started researching other blockchain platforms to see how they could migrate Bitswift forward. They looked into Ethereum, Waves, Nxt and various other technologies. A decision was nearly made to fork Nxt and launch Bitswift with a modified version of Nxt codebase. Through reviewing Nxt the team became aware of Ardor. After reviewing the Ardor platform design, a decision was made to migrate under Ardor as a child chain. The child chain infrastructure seemed to solve all of the problems the dev team was up against, blokchain bloat, reducing fees, light weight clients, stability, security, everything. It just made sense to migrate Bitswift tokens under Ardor so that the Bitswift dev team could devote their energy on platforms that utilize Bitswift tokens rather then worrying about blockchain infrastructure dealings. To prepare for the Ardor migration Bitswift tokens were manually swapped by users from the original Bitswift blockchain into a Nxt asset in a 1 to 1 manner. Official announcement made by Bittrex at the time can be found here: https://support.bittrex.com/hc/en-us/articles/115000719871-Support-for-the-Bitswift-SWIFT-blockchain-swap-to-an-NXT-asset . This Bitswift asset in Nxt was used as a placeholder for user data while Ardor was in the final stages of development. When Ardor launched into production on January 1st 2018 the Bitswift asset on Nxt was frozen and balance data totals reflected in a 1 to 1 manner in Bitswifts new Ardor child chain (Bitswift Blockchain). Bitswift users now able to log into Ardor using their Nxt passphrase and their Bitswift balances being available. This leads us to the Bitswift you see today, an Ardor child chain with a growing community and a proper dev team who cares about the project. The focus no longer on creating a quicker version of the Bitcoin protocol, but on integrating users and business to token ecosystems through Bitswift tokens and the Bitswift blockchain platform. As part of the development process, the Bitswift dev team eliminated (burned) 176727.2540738 Bitswift tokens from circulation on 04-Dec-2017 22:22:48. The tokens were deleted using the delete asset option within the Nxt platform. The transaction ID on the Nxt blockchain related to the token burn is 16081451041357660464. On January 1st 2018, 00:00:00 UTC Bitswift tokens were successfully migrated from the Nxt asset placeholder to the Ardor child chain as part of the Ardor genesis launch. Bitswift is now a fully functional child chain / blockchain within the Ardor platform. A 10% allocation of the total Bitswift supply was donated by the Bitswift developers to blanket on top of all Ignis holders at the time of Ardor launch. On January 1st 2018, all Ignis holders were credited with Bitswift tokens proportional to their Ignis balance. For every 2500 Ignis tokens on account, the user would have received 1 Bitswift token as part of the airdrop. Bitswift dev team releases https://Bitswift.network, the public block and market explorer relating to Bitswift tokens and blockchain network. Bittrex re-activated the Bitswift market on 2/9/2018 with the Bitswift market now hooked to the Bitswift child chain under the Ardor platform. With Bittrex also swapped to the new infrastructure trading on the primary market had resumed. The new Bitswift.tech site launches setting the new theme / vibe / direction for Bitswift.tech. Bitswift.tech announces Bitswift Remote Agent (Bitswift_Agent) . Bitswift Decentralized team announces the specific blockchain website development (bitswift.io) and the addition of Bitswift.cash service which is designed to make the Bitswift ecosystem easily accessible. Bitswift team releases Bitswift.io, a dedicated site for information related to the Bitswift blockchain and token products. The team also releases the Bitswift LZLZ forging pool. Bitswift.shop updated, new categories and products added. Social network links added, general shop tune up. Bitswift.tech announces Ottawa area expansion. Bitswift Decentralized Applications announces bitswift.cash business service. Bitswift.cash adds additional claimable assets in the blockchain item mine. Support automatic withdrawal and deposit options for supported tokens. Bitswift Agent deployed across 100 customer machines. Bitswift.tech customer base expanding rapidly, new contracts and partnerships formed. 151 Digital citizens on Bitswift.cash. Bitswift.shop new database hookup supporting autonomous distributor hooks.